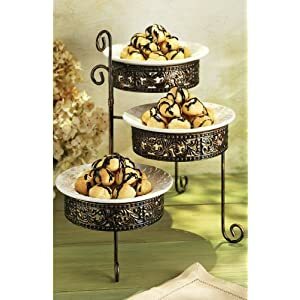 When you are planning your next tea party, think about how you will present the food you will be serving. Hopefully you have already chosen a theme and color scheme for your party. The adornments you use with your food presentation will go with your theme and colors. But, how you present your food will make it more appealing. 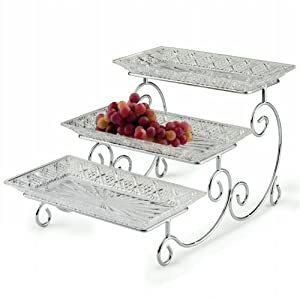 Varying heights creates a “tablescape” like a landscape on your table. Tiered plates of food add height, as does adding risers under plates. When using tiered plates many options are available to you. Some are pretty inexpensive and usually designed for just a few uses. Others are more sturdy, which also means they cost more, but they can be used for years to come and are worth the investment. Here are a couple of great options for you. These make beautiful tablescapes when combined with a few plates or bowls surrounding it placed flat on the table. Click on the image to see more about it, purchase it, or browse more tiered food presentation options. Adding risers under your plates of food will also create height for your tablescape. Use a sturdy box or inverted bowl, drape it with a fabric that works with your theme and color scheme, then set your platter of food on top. Use several different-sized risers to end up with a pleasing look to your tablescape. Varying the height of your food plates and bowls will also allow better access to the food items for your guests. Set up your tea service as a small vignette next to the food. Be sure to pick a teapot that matches your theme. Whether it’s a whimsical theme, or a romantic theme, a coordinated teapot will delight your guests. You know I love height for a food table! These are great ideas for a tea party. You’ll be the talk of the tea party if your food is presented like these!